Limelight Tile & Ceramics is accepting submissions from both aspiring and established designers to have their original tile designs become part of our Artist’s Collection. As part of our Artist’s Collection, your work will be marketed to our clients and included in online campaigns. If a client chooses your design, it will then be put into production and part of Limelight’s permanent collection, unless the client would like to purchase the tile exclusively. Our goal is simple – to feature artists and their original designs, and to showcase Limelight’s production capabilities. Artists must submit both 2D and 3D drawings of their designs. Please include renderings from different angles: front view, side view, and cross section (as needed). Also include a multi-tile arrangement of your design. Included with application form is an example submission. One (1) 11 x 17” illustration. Oriented in landscape. Black and white illustrations should be scanned at 1200 dpi. Color illustrations should be scanned at 300 dpi. Please submit your finished works in either JPG or PDF formats. Vector illustrations should be submitted as a PDF. Any text or fonts used in your designs should be converted to outlines. Please include your name on your illustration. Designs should be titled. Include the title on your illustration. If your design is chosen for the Collection, these drawings will be your Artist Page in the catalog. 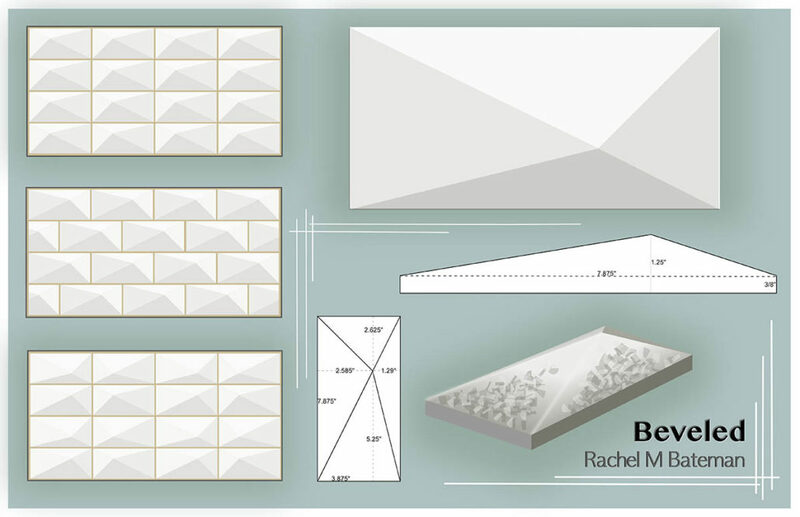 Your illustration may also be used by our in house artist to carve master tiles for molds. Include as much detail/information as you feel necessary to facilitate this step of the process. Include an artist’s statement and a description of the concept of your work. Please limit your artist’s statement to 500 words, and the description of your work to 250 words. Final submissions may be emailed to angela@limelighttile.com or uploaded to our Dropbox, please send and share “can edit” to angela@limelighttile.com. There is no limit on the number of designs that can be submitted. Original decorative tile designs that utilize dimensional surfaces, 3D textures, and unique shapes. Both classic and unique shapes are welcome. Limelight’s process allows for almost any conceivable shape. However, tiles are trimmed by hand, therefore, excessively complex shapes may not be chosen. A design may be made of differently shaped tiles that combine to form a homogenous surface. Designs may include a high degree of relief and almost any detailed pattern or texture can be accommodated, but must contain NO undercuts. Any submission containing undercuts will not be considered. Textures that are difficult to convey in 2D can be further described in the design statement. An image of a texture can also be shared on the document. Designs should take into account that Limelight’s process has optimal tile sizes. Tiles must be no less than 2 x 2”, no more than 8 x 8”, and 0.25 – 1.5” thick. Maintaining these proportions is crucial for production. The thickness limits should be viewed as extremes. Tiles may occasionally be as thin as 0.25” or as thick as 1.5”, however, for practical reasons these extremes cannot take up the majority of the tile, and should be transitioned to smoothly, i.e. designs cannot step from 0.25 to 1.5”. Typical thickness is 0.375 – 0.75”. Consider the dimensions of common places for tile. Backsplashes, showers, chair rail, etc. When designing, consider that when produced, one single tile will be one single glaze color. Limelight’s glaze gallery can be found at www.limelighttile.com/products/glaze-gallery. Any pattern or design on a tile must be achieved with physical dimension. Color variation can be achieved by applying different colors to different individual tiles within a design set. Consider that upward edges/angles will create breaks (where glaze becomes thinner/lighter/different in color) and dips or recesses will create pools (where glaze becomes thicker/darker). Designs cannot be color dependent. Part of Limelight’s custom service is clients choose the color for any given tile design. Our goal is to make unique, custom tiles. Our collection spans the design spectrum from modern to classic, from abstract to representational. In short, design what you do best, and make it a tile! Keep in mind, our process is in large part hand crafted and that the nature of glaze will affect the single color of a tile. Using dimension to create pattern and design takes advantage of the inherent characteristics of clay. SIMPLE DESIGNS: While a very simple design may be selected, if it lacks creativity or uniqueness, the design will qualify for a $250 award. COMPLEX DESIGNS: Selected designs that are more complex and hold a specific uniqueness will be awarded $500. If a designer’s tile is produced into samples, the designer will be awarded an additional $250. If an order is placed, the designer will receive another $250. Upon production, we will send the designer one pattern repeat or one square foot of their tile for their portfolio. *Unaware of the quantity or quality of the submissions to the “Call for Artists”, we have yet to decide how many will be selected. We ideally would like to have 50-100 designs in our Artist Collection. If a design is not chosen initially, but seems to fit the needs of a future client, we will present the design to them. If the client chooses the design and we end up producing the tile, the same guidelines and awards will be held. Up to five designs may be chosen immediately to be made into actual sample tiles, resulting in the additional $250 award and a higher likelihood to be ordered by a client, resulting in the final $250 award.